LILLINGTON - Life is challenging, but for adults with developmental disabilities it is especially difficult. Math, reading, even something as simple as making a phone call, can be overwhelming. Central Carolina Community College's Compensatory Education program, located at the Lillington Adult Education Center, provides training in acquiring both basic skills and life skills crucial to the students becoming adults who are as independent and productive as possible. Ranging in age from 18 to 60, the students represent a wide range of disabilities - from physical and intellectual to multiple disabilities such as deafness and legal blindness. Much of the progress these students make is incremental but positive, said lead instructor Elizabeth King. "Most students require an average of two years to complete a level, but the program is much slower than the GED or other programs. Our goal is to prepare students for living on their own, or, if not, to be as independent as they can be." A veteran of 25 years experience with special needs adult education, King refers to her job as an adventure. "You never know from one day to the next what accomplishments you'll see," she said. One of her proudest moments was teaching a student to make coleslaw, King remembered: "She came to me one day and told me she'd made coleslaw at home and that her family loved it! I was ecstatic." Compensatory Education classes are free and students may remain in the program for as long as they choose to participate. The curriculum focuses on language, math, social studies, community living, consumer education, health, and vocational training. It is an academic, rather than a job-training program. "We work on skills like appropriate and inappropriate behavior, how to access services in the community, vocational training, writing your name and Social Security number, filling out job applications, answering the phone properly, and a number of other basic and living skills," King said. "We also focus on leisure activities such as music appreciation and gardening." The program receives additional support from the Harnett County Chapter of ARC of North Carolina. ARC, which has been providing services and advocacy for people with intellectual and developmental disabilities since 1953, believes these individuals should be fully included in the community and participate in all aspects of society. In 2012, 11 members of King's Compensatory Education class took first place in the talent competition at the Kiwanis Aktion Club Convention, an activity featuring talent, training and games, co-sponsored by ARC and the Kiwanis Club of Harnett County. The students won for their version of the song, "God Bless the USA." CCCC Compensatory Education students have also participated in the Harnett County Special Olympics, collected canned goods for food banks and are currently working on a community service project assembling gift buckets for elementary students with developmental disabilities. The colorful buckets contain stuffed animals, play dough, bubbles and other items. To qualify for the Compensatory Education program at CCCC, students must have a diagnosis of intellectual disabilities or a traumatic brain injury with functioning ability within the range of intellectual disability. Students must be 17 years of age or older and be released from public school. "The Compensatory Education program at CCCC is a real benefit to everyone," King said. "It educates our students about services they can access in the community and enables them to better interact with organizations and agencies. It also helps educate the community about people with developmental and learning disabilities and helps to remove some of the prejudices against them." For more information on the Compensatory Education program at Central Carolina Community College, contact Elizabeth King, Compensatory Education instructor, at 910-814-8977 or e-mail her at eking733@cccc.edu. 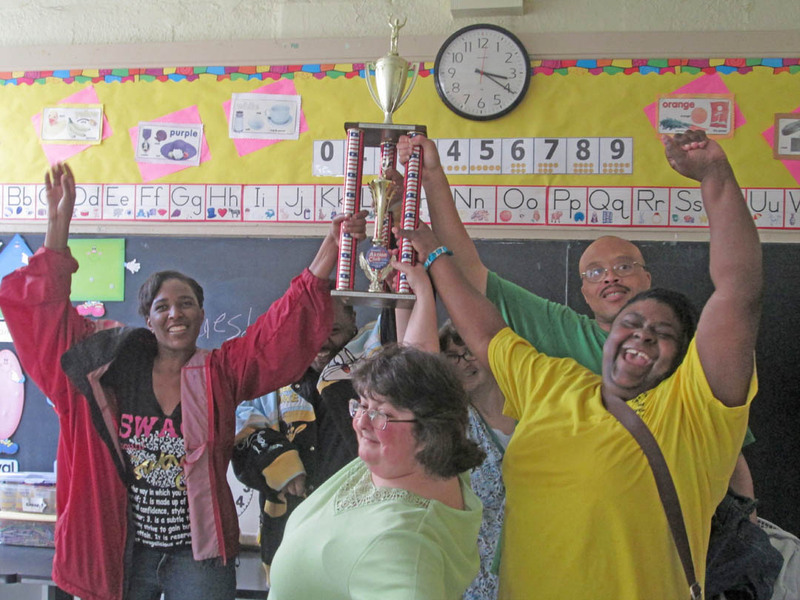 Students in instructor Elizabeth King's Compensatory Education class at Central Carolina Community College's Lillington Adult Education Center show off the first-place trophy they won at the Kiwanis Aktion Club Convention in 2012 for their rendition of 'God Bless the USA.' Holding the trophy are (front, from center) Natalie Barnes and Patrice McClain, and (back, from left) Ronnell Williams, Jamal Cameron, Melissa Williams, and Chico Williams. For more information on CCCC's Compensatory Education program, contact King at 910-814-8977 or e-mail her at .